Place the pepper halves on a baking tray under the grill for about 20 minutes (alternatively bake in the oven slightly longer at gas mark 5) turning halfway. Take out of the oven, let cool a little and remove as much of the skin as possible. Chop the peppers roughly and set aside. 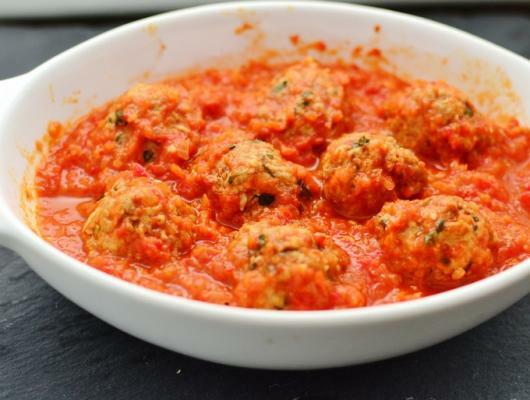 To make the meatballs, combine the meat, basil, 1 garlic clove, 1 tablespoon tomato puree, season and stir well. Form little balls, heat up 2 tablespoons of oil and fry the meatballs on a medium heat for about 6-7 minutes turning often. Set aside. To make the sauce, in a saucepan heat up 2 tablespoons of oil, add the bay leaf, onion, 1 garlic clove, celery and tomato, stir and let simmer for 2 minutes. Add the wine and cook for another 2 minutes. Add 1 tablespoon of tomato puree, season, cover and simmer for 15 minutes. Remove from the heat, discard the bay leaf, add the peppers and puree. Add the meatballs, heat up briefly if required and enjoy! 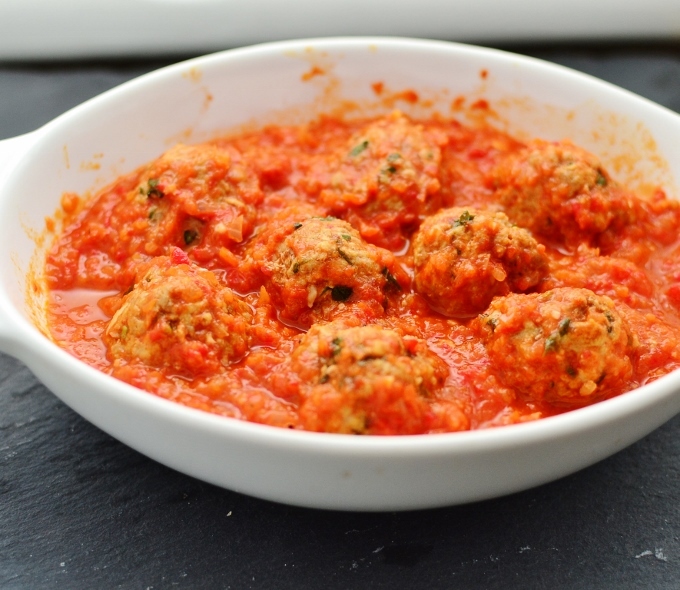 These healthy meatballs can be enjoyed with pasta, quinoa or simply on their own. They are gluten free, dairy free and low in fat.